Imagine walking this distance so early in the morning and in your office clothes. That was what happened to many of our beloved neighbors from Las Pinas and Paranaque as they got an ugly early morning surprise yesterday at the start of the APEC week. According to several tweets and Facebook statuses, their “Rude Awakening” happened sometime around 7am at the stretch of Coastal Road when cars just stopped moving. It was found out that some portions of Roxas Boulevard were closed and therefore caused bumper to bumper traffic at the whole stretch of Coastal Road. 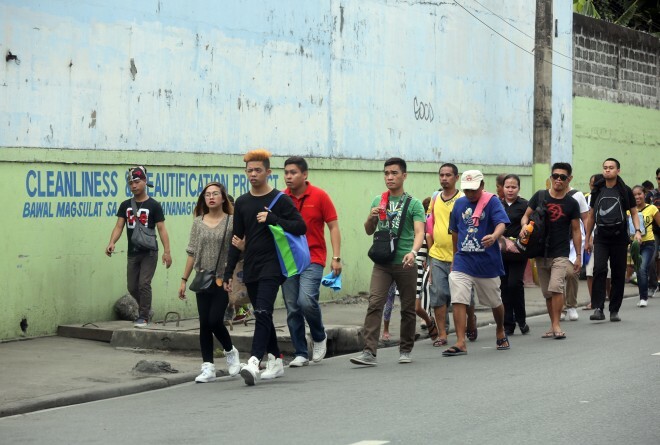 Many walked for a good one hour just to get to Roxas Boulevard to board buses. Many of them to board buses to go back to Cavite or Las Pinas. Pedicabs were also charging P250 from Baclaran to the nearest MRT station. Some motorists were lucky enough as they found themselves by the U-Turn slots so some just went back home or looked for alternate routes. Some UV Express vans just decided to give up and turn back home. Their passengers were given the option to just walk or just go home too. Many commuters were also caught in traffic in other parts of the metro. The authorities’ solutions — just stay at home OR walk.